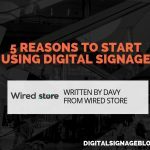 Digital Signage Blog is viewed by thousands of unique people every month and this number continues to grow with the high popularity and interest in digital signage technologies. We are partnered together with our sister site Digital Signage Portal combined to maximise our audience and your exposure. 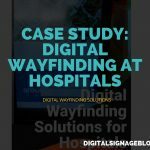 Whether you want to showcase a new product or just be heard, this is the opportunity for you to reach out to the digital signage community and stir up some viral impressions. Our blog entries are also picked up by Google Alerts for all users using the Google Alerts notification service (on digital signage). If we post a blog entry on that day, you can be sure that users subscribed to the service will receive a link to our blog entry in that day’s alert. We currently offer two forms of advertising – through Ads and Sponsorships. We have two types of Ads – Text and Banner. Banner Ads are served on a rotation basis with a selection of either at the top header of the page (468 x 60), on the right side pane below the sponsors (300 x 250), or both (discount applies for multiple ads). Text Ads are links contained under the Sponsored Links section in the right column, with a hyperlink pointing back to your site. Sponsorships are made available in the dedicated sponsorship section on the right side pane (125 x 125). They do not rotate and stay fixed. Sponsorships are offered at a fixed monthly rate (discount applies for longer periods). We also provide statistics of both the advertising and sponsorship campaigns for your benefit. We also have included a new sponsorship feature on our website. Businesses are now able to sponsor each article we have published. This allows businesses to target their sponsorship based on articles related to their business. This will help drive more traffic to your business. For example if the article is discussing about the latest digital signage software and your business sells digital signage software, then there is higher chance more people will click on your business link. This also helps with Search Engine Optimisation and help your business rank higher on Google. If you’d like to advertise through our blog or secure a sponsorship with us, please contact us here and we can help you come up with a suitable plan. 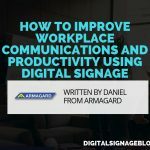 Or simply email us at info@digitalsignageblog.com.